Tulou are unique Chinese buildings meant for community living and made of rammed earth. Tulou in Chinese translates into "earthen castle". Rammed earth is an ancient building material which is being revived again as people seek more sustainable building materials and natural building methods. More details about rammed earth can be found in Wikipedia. The Tulou mostly built from 12th century onwards, are usually a large enclosed structure, rectangular or circular in shape, with a very thick weight supporting earth wall (up to 6 feet thick, which makes it bullet proof) and wooden interior, from three to five stories high, housing up to 80-100 families. These usually have only one main gate, guarded by 4-5 inch thick wooden doors, reinforced with an outer shell of iron plate. The top level of these earth buildings usually had gun holes for defence against bandits. The buildings are shared between families with each having two or three rooms. 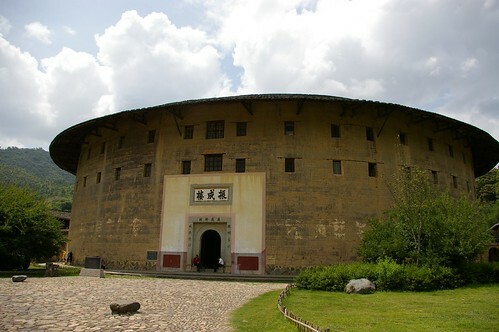 Although the exterior of the Tulou are generally plain, the insides are built for comfort and are often highly decorated. 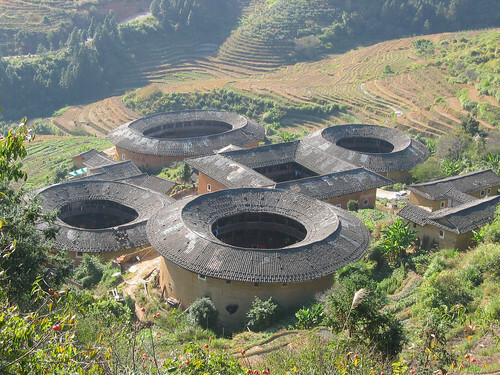 These buildings are mostly located in the mountainous areas in south-western Fujian region of China, hence these are known as Fujian Tulou. The Tulou are also called Hakka Tulou as these were initially built by Hakka inhabitants. There are more than three thousand Tulou located in south-western region of Fujian province, mostly in the mountainous regions of Yongding County of Longyan City and Nanjing County of Zhangzhou City. 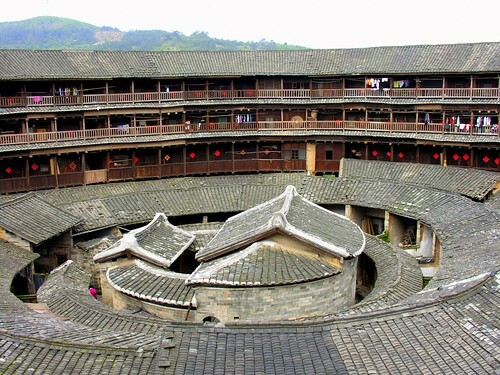 In 2008 UNESCO declared 10 such areas consisting of 46 Fujian Tulou as a World Heritage Site. Citing the reason as; "..... exceptional examples of a building tradition and function exemplifying a particular type of communal living and defensive organization, and, in terms of their harmonious relationship with their environment."